YAHAD, our family programming group, is geared for families with elementary school children. 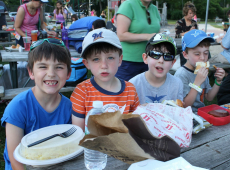 Whether you’re looking to build community beyond the walls of the religious school classroom, an opportunity to connect your MJDS student to the synagogue community, or a chance to spend time bonding with other parents, YAHAD has an opportunity for you and your family! 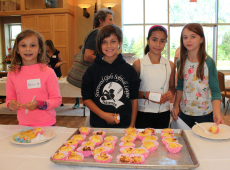 From one time programs like the 2nd Annual Kugel Cook-off, to monthly opportunities to celebrate Shabbat with other families, to book club just for adults with Sunday morning free time (not just parents! ), YAHAD has an event just for you. For more information or to make sure you receive reminders about upcoming events, contact Rabbi Schaller at RabbiLLL@ceebj.org and make sure to mark these upcoming events on your family calendar. This service will be offered once a month so all families will have the opportunity to come together over a meal and then pray together in a unique, interactive, musical worship service. 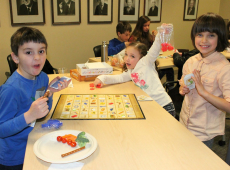 Each Shabbat B’Yahad experience offers children of all ages and those young at heart to join together and worship in an energetic, fun service. The Rabbis will try their best to keep this to a succinct one-hour service to accommodate early bedtimes. Each month we’ll begin our meal at 6:00 p.m. and welcome Shabbat together with song, stories, and prayer at 7:00 p.m. Monthly family learning program, ideal for children between the ages of 3-4 and their adult family members on select Sunday mornings from 9:30am to 10:30am. This is an opportunity for families to learn together, to get a taste of religious school style learning as a family, and to build community with other pre-school families. 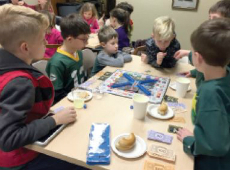 To make sure you receive updates for future Temple Tots events, call the Life Long Learning Office at 414-228-7545 or email Rabbi Schaller at RabbiLLL@ceebj.org. A 30 minute sing-a-long service perfect for pre-readers and their families, followed by a meal and playtime together.